The Hall of Famer is a shoe-in here. 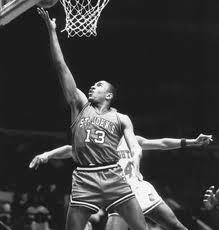 He is one of the most highly recruited players in the history of college basketball, even in 1980. Big Pat was one of the first freshman ever to star on his college team and is also one of the first players to wear a short-sleeved t-shirt under his jersey, a common trend of current players now. While these aren’t necessarily “important” stats, Ewing did bring the BIG EAST Conference its first-ever National title in 1984 and nearly made it two championships during his senior season before falling to Villanova in the title game. From his accomplishments at ‘Cuse, he became the No. 1 overall pick by the New Jersey Nets in the 1990 NBA draft. Even though he never became the player that Charles Barkley and Karl Malone were, that should not take away from what he did for the Orange. His No. 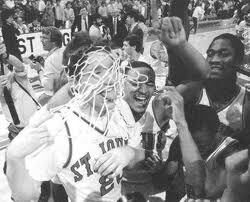 44 jersey is now retired at Syracuse and he was an NCAA All-American First Team selection and BIG EAST Player of the Year in 1990. This has nothing to do with my St. John’s bias. He has recently been inducted to the Naismith Basketball Hall of Fame, large in part because of what he accomplished for the Johnnies. He is the conference’s only three-time Player of the Year and was a member of the 1984 United States National Team, as well as a member of the 1992 “Dream Team,” along with Patrick Ewing. A Brooklyn native, Mulllin averaged 16.6 PPG as a rookie with STJ before being named league POY and an All-American in three-straight seasons. Allen will go down at the best or second best (dap to Reggie) 3-point shooter in basketball history, but at UConn he was thought to be potentially the next Jordan. The man some know as “Jesus Shuttleswoth,” showed why at Connecticut. He earned All-America honors and was named USA Basketball Male Athlete of the year in 1995. 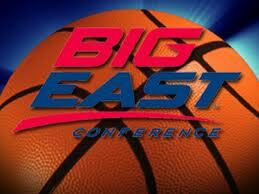 In his senior season he was a first-team All-American and was also the BIG EAST Player of the Year. (I realize that this is probably my Celtics bias standing out as I probably should have put Carmelo at SF and Mullin at SG). Another NBA No. 1 overall pick, Iverson is a man who put together one of the greatest freshman seasons in BIG EAST history (yes I recognize Carmelo as 1A), as he scored a conference record 357 points in his rookie campaign. Possibly JTII’s best recruit (although Ewing probably deserves the title), AI earned league Rookie of the Year honors and two Defensive Player of the Year nods. 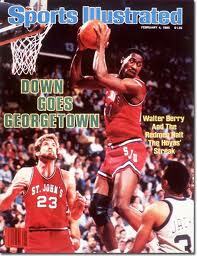 He ended his college career as the Hoya’s all-time leader in scoring average with 23. PPG. 6. Carmelo Anthony, Syracuse – A man that will probably be in most’s starting five, he won a National Championship in his only season at Syracuse and was considered to be in the running as the NBA’s No. 1 overall pick, before LeBron-mania took over. He definitely should have went No. 2, but we all know how much Joe Dumars loves men with the name Darko… did that come out wrong? 7. Kemba Walker, UConn – He single-handedly led UConn on one of the greatest runs in college basketball history last year, running through the BIG EAST Championship (apologies to Gary McGhee) and then on to the NCAA title. 8. Mark Jackson, St. John’s – He holds the BIG EAST record with 150 assists in a season in his 1985-86 campaign and could have easily been the starting point guard on this team, but Iverson shear skill level put him over for me. If in-game announcing skills were factored in, he would be bumped up a few spots. 9. Alozno Mourning, Georgetown – Mourning still holds the BIG EAST record with 26 free throws attempted in game (made 18) and shows just how dominant he was down low for the Hoyas. “Zo” led the nation in blocks in his rookie year and was an All-American before being selected with the No. 2 overall pick in the 1992 NBA draft. 10. Richard Hamilton, UConn – Even though he is more well-known for his face-mask these days, “Rip” was Connecticut’s silky smooth scorer with cut-off tee under his jersey in UConn’s run to the 1999 NCAA title where he was named the tournament’s Most Outstanding Player. 11. Dwayne Washington, Syracuse – “Pearl” makes it three players in-a-row with fantastic nicknames. The playground phenom was the No. 1 overall ranked high school player before going to ‘Cuse. The master of the shake-and-bake would be on seven of ESPN’s Top 10 plays if he were playing right now. 12. Walter Berry, St. John’s – Berry stayed home to play for St. John’s and won the John Wooden Award and BIG EAST Player of the Year honors, plus USBWA College Player of the Year accolades in 1986, averaging 23 points and 11.1 rebounds. Is Sizemore the Right Answer? Fresh off a Patriots loss to the Giants that was eerily similar to Super Bowl 42, I sit down at my lap top tonight to write about the Boston Red Sox. 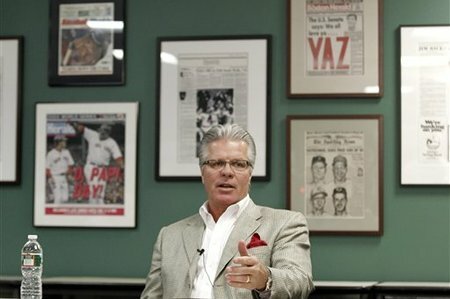 While the NBA is in the midst of a lockout that could very well cancel the entire 2011-2012 NBA season and prematurely end the window of opportunity for the Boston Celtics to win a title, I can only think about the Boston Red Sox. With the Bruins drinking coffee, taking a cold shower, pumping their bodies with Vitamin C, and doing everything possible to cure their Stanley Cup hangover, I am focused on the Boston Red Sox off-season. It’s no secret that the Red Sox are my passion. I could write about my Texas Longhorns with their two-headed freshman quarterback and how I don’t see a national title in their future any time soon. I could write about the commencement of Ed Cooley’s tenure at Providence College and his quest to bring the program back to some sort of respectability. If any of my colleagues want to get back on the blog, they are more than welcome. I just rather write about the Sox. With all that being said, it is rumor season, also known as hot stove season in baseball. Anyone who knows me knows I love finding all the rumors and throwing them out there in the course of casual conversation. There has been plenty of speculation about who the next Red Sox manager is going to be. To be honest, that conversation bores me. I am more fascinated with player movement, which at last brings me to the point of this post. 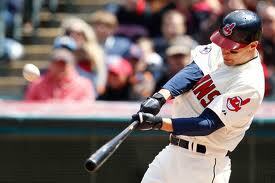 On October 31, 2o11 the Cleveland Indians declined their option to bring back Grady Sizemore. Sizemore was once the face of the franchise, perennial All-Star, and the reason for a fan club known as Grady’s Lady’s. The injury bug has stricken Sizemore over the past 2 seasons as he has only played 104 games since 2009. Back in 2006 and 2007 Sizemore was one of the best outfielder’s in the game, leading the league in runs and doubles in 2006. JD Drew has finally played out his contract leaving an opening in right field for the Sox. The in-house replacements are Ryan Kalish and Josh Reddick. Kalish is coming off a year in which he was hurt for the majority of the season with a shoulder issue and never saw time with the big club in 2011 after a nice showing in 2010. Reddick started his 2011 season in great fashion hitting as high as .348 but then came crashing down to earth at the plate and showed he was a defensive liability. deal worth about $8 million and call it a low risk high reward type deal. It worked with Beltre back in 2009 as he led the league in doubles with 49, hit .321 with 28 home runs and 102 runs batted in. He played 154 games proving his durability. That one year was a perfect audition for the rest of Major League Baseball. The Rangers went on to sign him to a 6 year $96 million deal. It proved to be a win-win for Beltre and the Red Sox. If Ben Cherington and the rest of the Red Sox brass feel that Kalish and/or Reddick aren’t ready to be an everyday player in right field they can turn to Sizemore and offer him a Beltre-esque deal. 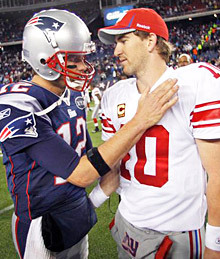 Ultimately, I would not be upset if that were to happen. I loved Sizemore back in 2006 much like I loved Lohan. An outfield of Crawford, Ellsbury, and a healthy Sizemore would be unbelievable. 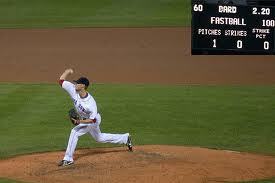 I see no reason why the Red Sox can’t offer him a one year deal. My only reservation is the amount of pink hats would most likely double and there would be a Grady’s Lady’s section followed by an Ells’ Belle’s section at Fenway Park. I last wrote on this blog on July 8, 2011, 4 months ago. For whatever reason I lost my motivation to write after the Bruins won the Stanley Cup. 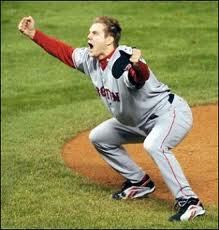 It is fair to say that I am a microcosm of the 2011 Boston Red Sox. For awhile, I was going at a good clip, writing everyday and generating thought amongst the faithful readers of this blog. Then I started drinking my beers, eating my fried chicken, playing an absurd amount of PS3, and putting on some lbs. With those horrid 4 months behind me, I look to start over again and bring this blog back to some form of prominence. What better way to do it then to address my favorite franchise in all of professional sports and the disaster they have become. 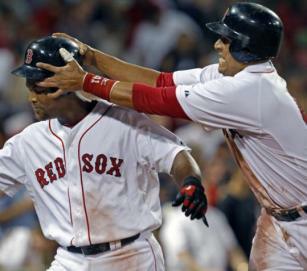 Everyone knows what happened to the Red Sox in 2011, so there is no need to open wounds that have just started to scab. Instead, I am going to be progressive and look to the future and see what changes can be made that will get the Red Sox out of the pre-2004 era and back into the 2004-2007 timeframe. First things first; With Terry Francona gone and likely headed to St. Louis, the Red Sox organization needs to find a manager to right the ship. New general manager Ben Cherrington has probably the most talented all around roster in baseball he just needs someone to steer the unit in the right direction. Names that have been rumored and/or interviewed to this point have been Pete Mackanin, Dale Sveum, Mike Maddux, Sandy Alomar, Jr, and Bobby Valentine. 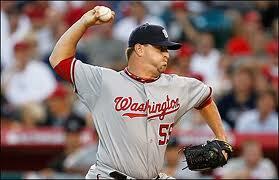 Cherrington has said that he wants someone with major league experience. I disagree with him here. If someone is available that has major league experience, they are available for a reason. They couldn’t win where they were before and were relieved of their duties. In 15 years of managing at the big league level, Bobby Valentine has a record of 1117-1072. That is a winning percentage of .510. If 15 years, he has one exactly one pennant and didn’t win a World Series. Why his name continuously comes up when a managerial job opens up is beyond me. Sure he won in Japan, but baseball is backwards in Japan. Isn’t Dice-k tangible evidence of that? Bobby Valentine? No, thank you. Dale Sveum was the Red Sox third base coach in 2004 and 2005. 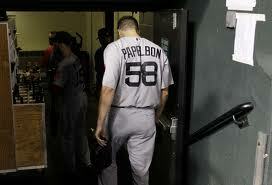 Frankly, I don’t have one happy memory of him being in Boston. He didn’t do well in Boston and if he couldn’t handle the job as a third base coach, what would make someone think he’d be able to take on additional duties as a manager? He had a successful year in Milwaukee as a hitting coach, but when you have a lineup that includes Prince Fielder, Rickie Weeks, and Ryan Braun it is difficult to be unsuccessful. 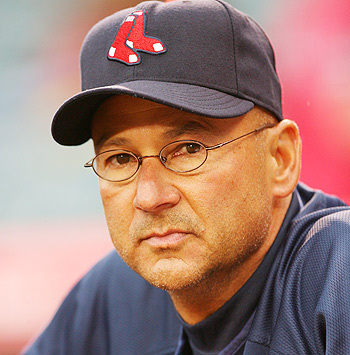 In addition Dale Sveum even looks like Terry Francona. Bringing in Sveum would just be more of the Sveum old problems. Pete MacKanin. To be honest his hair is just way too much for me. I don’t know a single thing about the man other than he has been in baseball for 35 years and never has had a managerial position. Theo and the Cubs are interested in him as well. If I could ever get over the crazy hair style, I think he would be a good candidate to be the fresh voice the Red Sox need in the dugout. The last two candidates, Sandy Alomar Jr. and Mike Maddux are two guys that I would prefer. Alomar was a great catcher for a number of years and has a great knowledge of the game. Like Maddux, he comes from a family of major league baseball players that include Hall of Famers. There is something to be said coming from a pedigree of that nature. Just ask Buddy, Rex, or Rob Ryan. I also believe both of these candidates would be very influential on the Red Sox pitching staff. The Red Sox pitching crumbled spectacularly in September and proved to be the biggest weakness and a team that on paper looked very good, but on the field was very much flawed. Because of their baseball pedigree’s I would have to believe that both men would instantly garner the respect of every man in that clubhouse. If the Red Sox hire either of these 2 candidates, it would be a step in the right direction for a troubled franchise.